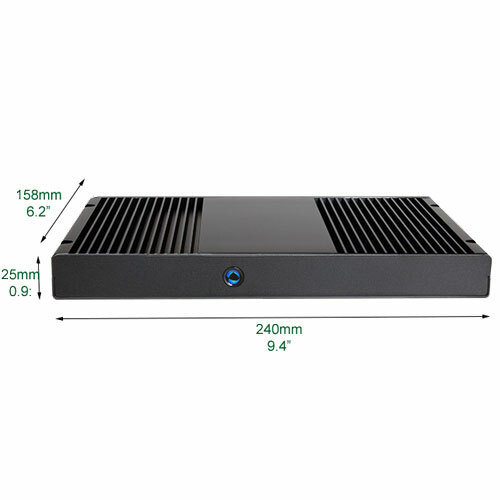 DEX5350 Digital signage fanless mini pc system with dual HDMI supports Ultra HD 4K resolution is a fanless media player with advanced scheduling possibilities. This high-end computing device supports Ultra HD resolution (4K) playback and its slim (25 mm) solid-state design makes the DEX5350 a significant asset to multiple industries including the kiosk market. Digital Engine DEX5350 is a Fanless PC computer designed for tough environments. It is designed for vigorous or highly sensitive environments where digital information displays, medical appliances, POS or kiosks are running. Thanks to its Fanless-PC design the system is very quiet, reliable and flexible as to their location. The DEX5350 Fanless PC supports the 5th Generation Intel® Core™ processor family (i3, i5, i7) for brilliant imagery and a seamless computing experience. It has 2 independent display outputs with 3 independent audio outputs for multi display purposes.